Ok, it’s not the worst idea for an Elseworlds. Maybe. It was the early 1990s and DC Comics was still riding high on Tim Burton’s recent Batman movie. In 1989, the same year as the theatrical release, DC published a book containing a Victorian Batman called Gotham By Gaslight. By 1992, DC had put out a few Elseworlds books, capitalizing on fan desires for as much Batman as possible (maybe not as much as we have now, actually) while being outside of continuity. This is theoretically appealing to new readers, old fans who haven’t read a comic in a long time, and current obsessives amused by divergent takes on their favorite character. The best of these books ask interesting questions, allowing the development of a familiar persona in an unfamiliar setting and deliver complex answers in artful fashions. Some, however, are more mundane affairs, getting by mostly on the title premise and little real substance. 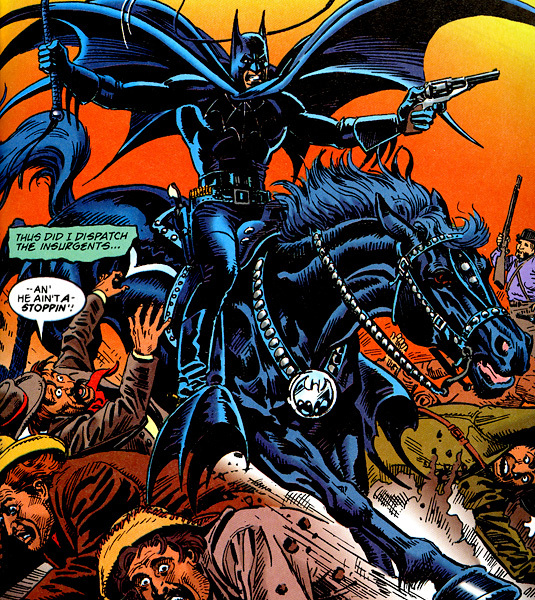 One might hope that Batman: The Blue, The Grey, and The Bat would somehow sidestep the inherent silliness of Batman on a Bathorse and tell an interesting story of intrigue set out west in the time of the Civil War. The creators have a large amount of industry experience – it’s co-written by Elliot S. Maggin and Alan Lee Weiss, both working for DC since the early 1970s. 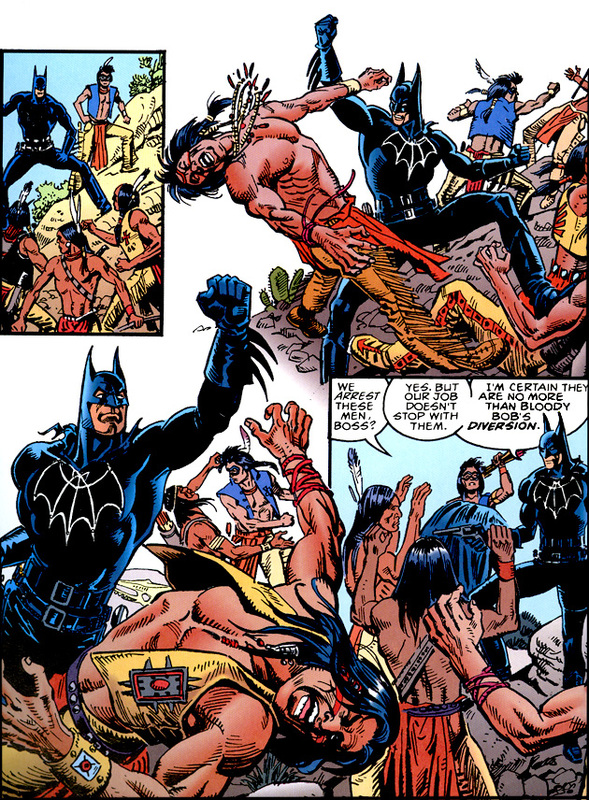 Weiss also illustrates with José Luis García-López inking. But the long time DC employment of both these creators may not be purely a benefit to this book. In fact, it seems to have some of the worst pre-crisis mentality about it. The character designs, for one, seem to be a combination of terrible 90s aesthetic with the silliness of the early 70s. Horse with a giant Bat medallion, really? A man in the middle of the desert in what seems to be a black leather jumpsuit? And did I mention that the horse’s name is Apocalypse? So they went the ridiculously silly route. That could still work. If they were aware of it. The supporting cast is mostly lame – Lincoln, of course, and Wild Bill Hikkok fills his role as expected recognizable cowboy. The presence of Sam Clemens is welcome, but underutilized – his character is boring and mostly plays the role of “in the way intellectual” when it comes to the action. 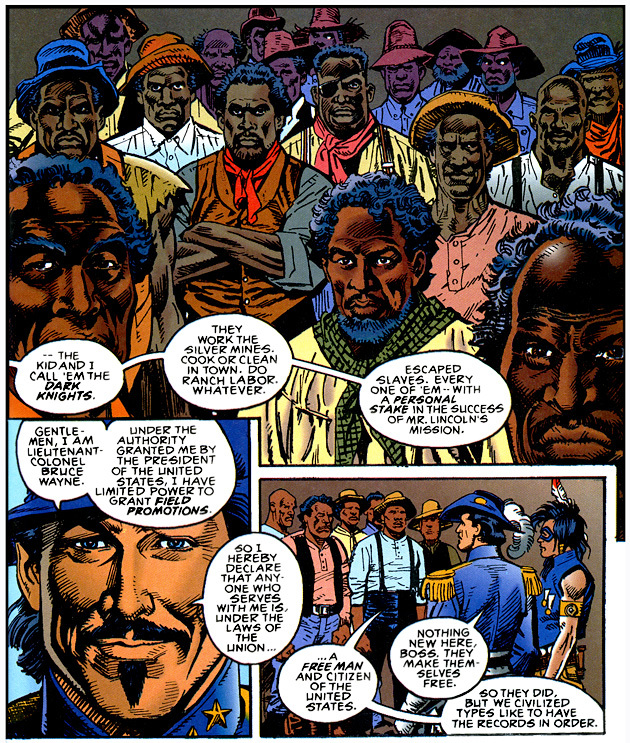 The only interesting choice is Kit Carson, who a reoccurring DC Western character as well as a real life person – but he’s only got a one page cameo. Likewise, the presence of “Dark Knights,” a troupe of freed slaves fighting alongside the union army, brings possibility beyond being a terrible pun. But the authors somehow manage to avoid giving any of these potentially heroic characters so much as a speaking line. As for the villains, we’ve got a ridiculously two dimensional confederate criminal, some barely-there French soldiers out of Mexico, and a “surprise” that you could see coming with a blindfold on. Everything clicks together, so it’s not a total failure as a story (there’s a beginning, a middle, and an end and some sort of flow). But it’s not particularly exciting either. It feels more like a quick imaginary tale out of the 70s than something that hoped to compete on the shelves alongside some of the intricate storytelling going on in the 90s. There was a lot of crap in the 90s, too, but this feels like dated mediocrity, not bombastic Malibu style schlock. Perhaps the long time creators were just phoning it in – I’m not familiar enough with the specifics of their oeuvre to tell you if this is indicative of their general work. Perhaps the worst of it is that it just doesn’t feel like a Batman story. 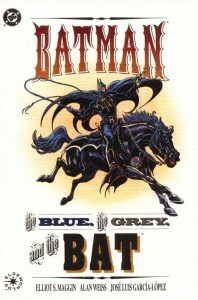 Batman: The Blue, The Grey, and the Bat could have dropped “the Bat” entirely, replacing him with a more standard Western hero. He doesn’t do anything particularly Batman-like, doesn’t act at all like a stalker of the night, and his partner seems to be Robin-based just ’cause. 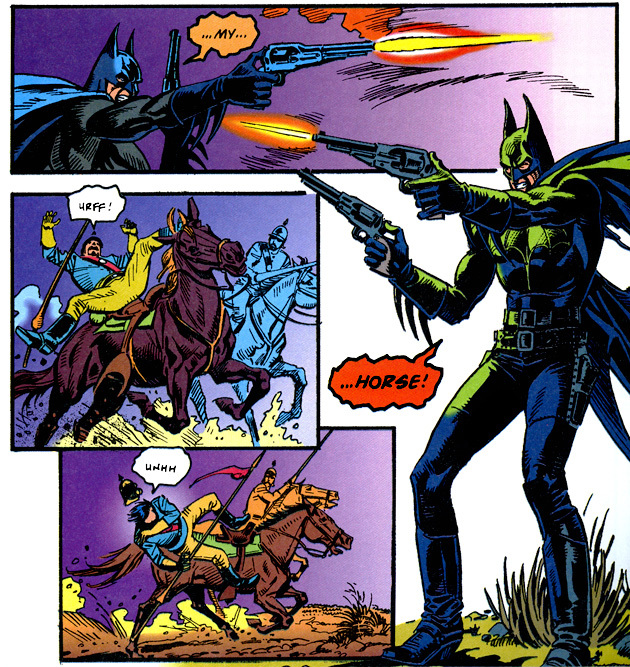 Batman’s use of guns is also strange here – makes sense for a Western hero, but it’s extremely odd to see him, Western Robin, and even Wild Bill Hikkok shooting guns out of hands in every close up scene. And then seemingly killing without much mention of it later in the book. He’s even proud, apparently, about Redbird exacting bloody revenge in one scene. 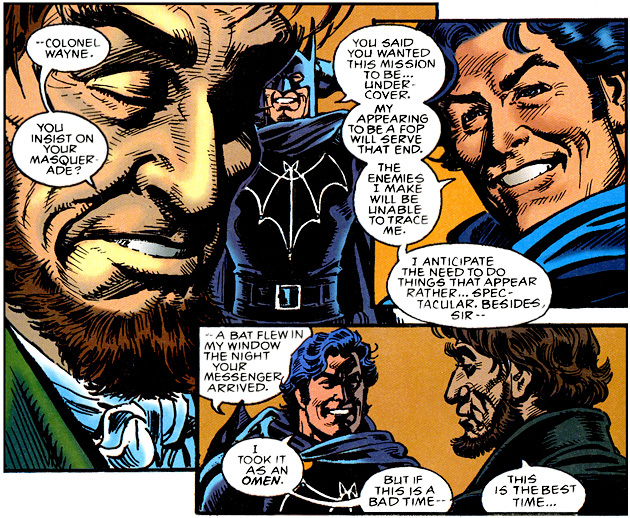 While Bruce Wayne as a foppish union captain is kind of fun – especially the mustache – Batman doesn’t even seem overly concerned at keeping his identity secret. In fact, there’s some weirdness where it seems that he tells some characters, or changes right in front of them, an then later they act like they didn’t know in order to deliver some extremely cliche lines. It doesn’t even make sense. As for the art, it’s serviceable work by Alan Lee Weiss. At its best it reminds one of the Batman comics of the late 70s, often created by Neal Adams. But much of the zest just isn’t there, with stiff arms and action looking more like people strangely standing around in punching positions versus actually throwing forceful blows. While some of the closeups can be repetitive (Clemens in particular has a great, slightly sad, sidelong glance, which is unfortunately used in three nearly identical closeups), the faces are rarely distorted and the proportions are always correct. Yet something about the art just felt off. Maybe it’s the early digital coloring, which is very saturated and heavy on the gradients. Along with the sometimes heavy inking and awkwardly placed panels, the pages feel very weighed down. Sometimes the colors are extremely badly chosen, leading to a very tan Bruce Wayne, or a Batsuit with odd green highlights. It’s a shame, because you can tell a lot of time went into the book, especially with computers at the level they were in 1992. In a lot of ways, Batman: The Blue, The Grey, and the Bat is a class production. The cover is printed on really nice linen stock with embossed art. The font and design work is excellent. It’s just unfortunate that the interior is so mediocre. 2 out of 5 stars. 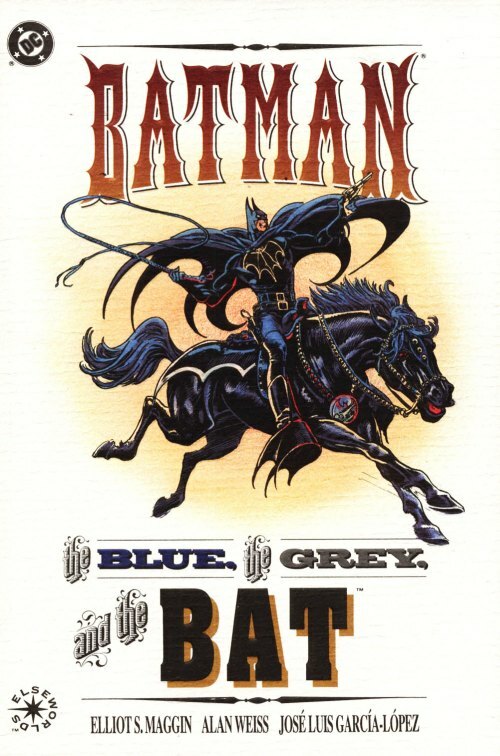 Pick it up only if you really want to see Batman as a cowboy. 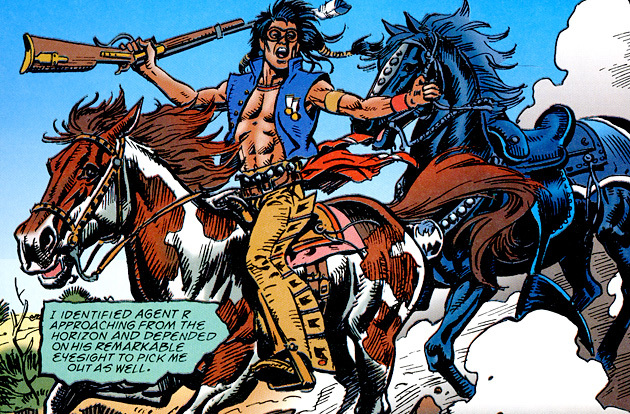 But it’s mainly a strangely designed costume and tenuous links to an uninteresting Robin-like character that mark him as such – it’s really a mediocre Western comic. Hardly a Batman story at all. Luckily, it can be found on ebay for about two bucks, putting it in that ideal price range for a gag gift. Not in any way. Once in a while, these Elseworlds iterations show up in mainstream books (like Red Son or the Kingdom Come Supermen), but I doubt anyone has much love for this Wayne. You don’t really have to read anything before this book, but if you’ve somehow never heard of the Batman, Year One or Batman: Chronicles are good places to start. If you’re looking for an actually good Elseworlds title, I quite like Batman: Holy Terror or The Golden Age, which might be most enjoyable with a little more knowledge of DC history. And of course, there’s Superman: Red Son, which Marc recently reviewed. If you’re looking for an out of continuity book that’s so amazingly bad that it’s somehow good again, you can’t go wrong with Batman: Digital Justice. Finally, if you somehow stumbled upon this in a search for some good western comics, DC has published a fair few. Check out the DC Western list, only a couple books on there are really bad and we’ve recently reviewed almost all of them. 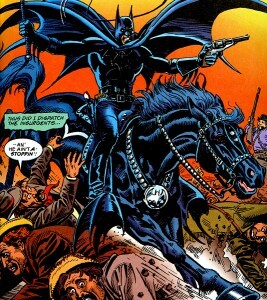 Let’s be serious: WHO doesn’t want to see the caped crusader as a batlike-dressed cowboy? I hope there’s a copy of it at amazon.de. I think I’ll just wait for Batman: The Retrun of Bruce Wayne comes out in Feb.
Not only is Bruce playing a cowboy but he is joined by Hex as well. haha, just trying to be honest. To a collector like me, of course, this book is absolutely essential. book-marked it and also added your RSS feeds, so when I have time I will be back to read much more, Please do keep up the superb work.